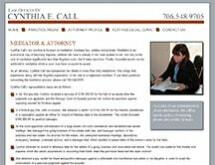 Based in Athens, Cynthia E. Call provides keen legal counsel and efficient representation to individuals, families and businesses throughout the surrounding areas of Georgia. Ms. Call has achieved an impressive record of results, including $196,000 recovered on behalf of the heir of a Georgia estate. This was her very first jury trial. Since then, she has continued to successfully uphold her clients' rights while providing the personalized service they deserve. In 2016, in a suit involving an estate, she achieved a jury trial verdict with co-counsel for 37 acres of land, two houses, and the cash accounts of a family partnership. Call the law firm of Cynthia E. Call in Athens to schedule an initial consultation about estate planning, probate, guardianships or any other area of practice. Unless she is in trial, Ms. Call returns all phone messages within 24 hours.